Apply only onto clean, dry or damp surfaces from which all contaminates have been removed; i.e. build up crankcase drippings, oil spots, loose traffic paint, etc. Areas upon which a high build-up of grease or loose paint exists shall be scraped, wire brushed and then torch prepared to completely eliminate the contaminate from the underlying, sound asphaltic substrate. Where surface profile restoration of divots, depressions or slightly off grade areas is desired SteelGuard may first be mixed with 20 mesh sand to a thick paste consistency then placed into the low areas and troweled smooth. These areas should be allowed to cure prior to surfacing the balance of the project. SteelGuard is supplied in a high viscosity, semi-paste consistency. This is necessary to insure anti-settling properties. Immediately prior to application a pre-determined, small quantity of potable water shall be slowly mixed into the easily stirred contents. Before diluting large quantities for application it is recommended the installer pre-determine the appropriate dilution ratio by placing a small quantity into a pail followed by adding water at an equivalent of one to three percent by volume of the SteelGuard within the pail. By blending in the added water and then spreading onto the intended surface, an accurate determination can be made of the best water dilution ratio to achieve desired spread and wet out properties. Do not over dilute this product as this will terminate the anti-settling qualities of the SteelGuard and could possibly diminish the useful qualities of its cured physical properties. 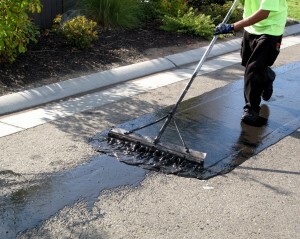 All damaged asphalt concrete should be removed and replaced with hot asphalt concrete. All cracks 1/8” or larger must be cleaned and filled to a level surface with a crackfiller. A “V” shaped squeegee is recommended for this application. New asphalt concrete must be in place and cured as per ASMA standard specifications. All areas to be sealed should be thoroughly cleaned. Excessive oil spots should be removed with a scraper, stiff brush and detergent. Prior to the first application of OverKote in exceptionally hot weather, dampen the surface with water. Remove any excess water to leave the surface only slightly damp. Depending on the Asphaltic surface, one or more applications should be applied at the rate of 20 to 35 gallons per 1,000 square feet of surface area. The surface should be smooth and uniform. (Dilute approximately with 10-15% water). Spread immediately by machine, squeegee, stiff plastic bristle or soft-hair broom. Spread from poured parallel lines by pulling material at an angle toward operator. Tools should be wet before using. Repeat as necessary to spread sealer uniformly, eliminating all laps and ridges. Apply 2nd coat as soon as first coat is dry.